You Are Now At Angkor, Siem Reap,Cambodia. We are the perfect Siem Reap tours operator choice for your Holiday in Siem Reap, Cambodia. Easy and lots to choose with selection from rental transportation, Airport Transfer in and out, activities for your Angkor Wat Temples visit to and within Siem Reap, Cambodia. Book our daily available tours anytime & anywhere as we are working with group our guides and drivers around the area. Our tours are private tours with our professional tour guides and drivers, we offer varies of transportation as we want to make sure we deliver the best services and prices out of Angkor, Siem Reap daily run by 100% local people like us. 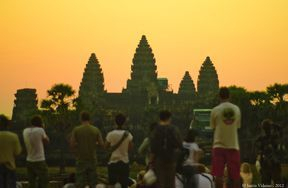 We based in Siem Reap and we are very happy to show you around with what Siem Reap has to offer. One of the remarkable remain un-restored temple in the remote area located about 70km away from Siem Reap. Visit local Village & Stop for a walk. jungle trekking get a Chance to see the Sunset along the way back. See All temples in one day seems impossible in Siem Reap as there are more than 70 Ruins in this Angkor Archaeological Park. but we are going to do and see different and of course we will not see them all, just some Major temples. North Gate of Angkor Thom, Pallilay Temple, Old Royal Places, Phimeanakas Temple, Baphoun, Elephant Terrace and Laper King Terrace. Our Professional Expert Local Tour Guides have been working together for long time to provide our clients with a full service of well-prepare tour plan for their Angkor temple trip visit and speak excellent English as some of them have been working over 10 years in this tourism industry. We Provided Multiply-languages Tour Guides Upon Requests As Well. All of our drivers are local base in Siem Reap and they are very flexible to our clients needs with their timing and suggested thing to do, where is the best spot to see them and when to see them, another plus to this our drivers also know where to take you for tasty food, good restaurant in town and are very gentle with a Cambodian Smile, sometimes you don't even need tour guides but please note that all of local drivers can not take you into the temple area and explain as professional tour guide does. Are you local Guides or Drivers? Join our community to become local host by register your own Day trips and start providing your local experiences with us today.